I've got lots of negative feedback for the Yahoo! column in which I suggested that military bases should gradually move out of big cities. The military is treated like a holy cow in India, and this results in tabooing logic in favour of national pride (some comments to my previous post use sound rational arguments, but many that I have junked simply question my patriotism). The conflict at the Siachen glacier is a good example of how patriotic thinking works. Thousands of Indian soldiers are posted in rotation on the highest battlefield in the world. They are there because of a botched preemptive strike the Indian army initiated back in 1984, resulting in a standoff in an uninhabitable zone of no strategic value. The cost in human lives as well as budgetary outlay has been staggering. Some 2000 Indian soldiers died in the first 13 years of the stalemate, there are no figures of how many more have perished in the 13 years since, but a total figure of around 3000 is probably accurate. Most of these deaths are due to harsh conditions, in which temperatures regularly dip to -60 degrees C. And yet there is no will to solve the Siachen issue through dialogue, no public pressure to bring these soldiers back. Far from suggesting a solution needs to be found, we celebrate the army's sacrifices in film, song and advertising. Consider, now, the issue of the Adarsh Housing society. Let's assume that everything was done according to the book, and the flats were given over to war veterans and Kargil widows. These apartments are worth some 80 million rupees each, nearly 2 million dollars. They are sold at 10 percent of their market value to people living on a monthly income of some 20,000 rupees, or 500 dollars. The fact is that, in ordinary circumstances, these veterans and widows would not be able to afford even the 80 lakhs they are charged. They buy the homes because they're great investments. As soon as they can, they sell the flats to civilians and buy themselves comfortable homes in the north of the city which cost half the market price of the Adarsh flats. They are left with some 30 million to put in fixed deposits at 10% interest, giving them 3 million rupees a year to live off, ten times what they are getting by way of pensions. These are back of the envelope calculations, but this sort of thing has played out in every housing scheme where defence personnel have been granted housing at subsidised rates. Within a few years, these complexes come to be occupied by civvies. Now, I'm not questioning whether or not these particular veterans and widows deserve the largesse. Let's presume they do. The fact remains that Adarsh would have housed civilians through sub-letting or direct sale within a few years of the keys of flats being handed over. The security risk the Navy is protesting about, in other words, exists independent of the corruption scandal. That' an example of the pressure a city like Bombay places on the military. The idea that I'm asking the armed forces to make sacrifices in favour of a builders' lobby is entirely wrong. My argument is that it might be beneficial even from the military's perspective to gradually vacate land in densely populated cities like Bombay, Poona and Bangalore. The military's presence spurs urban development upto a point, then becomes a neutral factor, before eventually turning into a net impediment. It is equally true that urban development helps the military upto a point by providing necessary services, but eventually becomes an impediment to optimal functioning. Cities grew as hubs of manufacturing, but many of the largest metropolises now host few working factories. Armies first flourished in forts, but now have no need for such structures. The Indian army recently moved out of Delhi fort, and I hope they will soon do the same in Agra fort, enhancing the city's heritage tourism potential. All I'm suggesting is that a similar flexibility be shown in considering the future of camps in metropolises. Better to draft a twenty year plan now than to have a decision forced on you twenty years down the line. 1.Theres no more respect anyways. 2.No person with established background joins voluntarily. 4.Difficult promotion scene not like IAS and other civil services. 5.Compromise on fundamental rights,I hope you as journalist would understand the price of this one!! 6.Political and bureaucratic interference in promotions and postings. Nobody cares anyways .Make the most of it and get out at the best moment.Your views on Armed forces their need and necessity needs a serious rethink pal.The last bastion of propriety is ready to crumble.Your views can only accelerate the process. You and I agree on the symptoms, Mr Anonymous, we just disagree on the solutions. I reiterate, a shift does not have to be a punishment. I also believe one should refrain from sob stories. Military men are paid reasonably well, and suffer relatively few casualties, except in places where they probably should not be present at all, like Siachen. In India, the majority survives on less than fifty rupees a day despite working hard. The armed forces should be seen as a viable professional career. 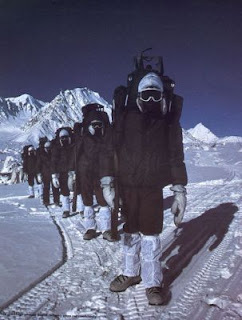 There was briefly this National Anthem film which ran in some movie theatres, featuring a row of freezing soldiers standing to attention in icy the Siachen wasteland, saluting the flag. They had been filmed from a helicopter in an attempt at ad-film glamour, and they stood there shivering bravely with the wind whipping around their faces. That film didn't make me feel patriotic in the least bit. It just drove home the irony of how we make our soldiers suffer needlessly for the sake of some imagined glory. Which is not to say that we don't need soldiers. I wish there were no wars and nobody had to kill anyone, but sadly, that isn't possible in our world. So, we need soldiers and we should be glad they do what they do. But Siachen really isn't about that, is it? Oh man that will be a shame. The Poona Cantonment like most other cantonments or camps as hey came to be called are places of beauty. Beautiful sprawling bungalows with manicured lawns. officers messes with polished cannons at the gates and polished silver on the tables. Buildings that epitomise an excellent use of local materials in their architecture. Spike Milligan lived at the Poona cantonment. no pavement encroachments. No illegal constructions , no incessant digging up of roads.in fact almost none of the plagues of urban living that detract from Liberty and the pursuit of happiness in other urban spaces. The thought of a Narayan Rane spitting pan on the ashlar masonry of the RSI portals ranks up there with the best works of the Ramsay brothers or Stephen King. So while I buy you logic, sometimes let beauty prevail. Girish, Siachen aggression was started by pakistan who tried to show the area as belonging to them on maps and in 1984, the pakistani army sent a 'mountaneering expedition'. 1987 was the year when pakis intruded and established a bunker and were shooting at the Indian Army. Read up on Operation Rajiv (in memory of 2nd Lt Rajiv Pande, Veer Chakra) and search for Naib Subedar Bana Singh, Param Veer Chakra. Coming on to the topic, sir, even Manmohan and Sonia's house in Delhi also pose a problem to commuters, should we have them relocated to barren deserts and have them tele-conference instead of travelling since traffic is stopped for hours and jams are a regular feature due to these worthies. Even people coming to meet them also results in a similar ordeal for the common man. That's the justification provided for the preemptive move, I know. Even if you believe that justification, though, there's no reason not to negotiate a solution, is there? And we have every right to protest against disturbances caused by VIPs in cities. But there's a compelling need for the Prime Minister to be in the capital. Girish, imo, making a bunker in Indian territory is blatant intrusion and provocation which has to be answered appropriately. You dont negotiate with fanatics who believe in bleeding India with a thousand cuts, you crush them. Compelling need is all fine and dandy for the hoi-polloi, for a common man like me, it is painful to wait for endless hours in jams and VIP movement. Last i read, PM was still a public servant or are we lesser human beings? I don't know what you are arguing with, Tupac, it doesn't appear to be anything I have said. I have not, for example, said it's fine to have jams because of VIPs. All I've said is that while a solution needs to be found, it can't take the shape of having the cabinet move out of the capital. Also, the forces in Siachen have done nothing like crushing the opposition in the 25 years they've been there, nor is it even physically possible to crush opposition in that terrain. Pakistani troops are more comfortably off and get supplies by raod; we have to fly everything in by helicopter. The fact is that the problem needs a solution. There was an area with no agreed dividing line, and a dividing line needs to be nagotiated. Otherwise you're just condemning hundreds of Indian soldiers to die of exposure for no good reason. That's the paradox of patriotism. 1. i wrote earlier also but i think you are more wiser not to post it.here you are talking about only siachen, there is much that appalls me that a journalist like you also doesn't know about soldiers either getting injured or martyred in the valley and the north-east. but it is not your fault cause the media gives more importance to ambani's dog falling ill rather than difficulties faced by the nation.and a point i would like to make, as a country we are hungry people whether it is power or money, whosoever gets a chance will gobble everything he can that is to include senior military officers.the main reason i see is the population but nobody talks about framing new laws to control it due to obvious reasons politicians will not get votes if they do so.till the time we don't control it the problems of food ,shelter will remain.we should bring in laws like china for at least ten years. 2. the main reason for allotting homes in good areas to families of defence employees is that they get the benefits.eventually those will be sold off,why everyone else also invests in property so that they can get the returns. a) Germane to what I have written. For much of the time I have written this blog, comment moderation was disabled. However, there's been a jump in hate mail in recent weeks, and so I've decided to filter anonymous posts filled with personal insults or irrelevant tangential arguments. I must say I find point 1 that you make is typical of the tangential thinking I speak of. Why is it so difficult for people to concentrate on the thing being discussed rather than bring up a thousand other issues. I can assure you I'm well aware of the situation in the Valley and the North-East. When I write about those issues there will doubtless be comments about how I haven't thought of some other pressing matter. 2. I realise the purpose for allotting homes to defence personnel. The point I'm making is that this process would result in Adarsh becoming a security threat in the future even if all flats were allotted to widows and veterans. You have not addressed either of the points I make in my post, unfortunately. Military are paid reasonably well!!!! !...why are they leaving? LJF, I have no idea what you're talking about when you say I'm slandering the army. Please tell me exactly where the slander occurs. When I say reasonably well, I'm saying it in the context of the average Indian wage. I have been reading your Yahoo column for some time. I am not much into commenting, but wanted to mention that you have showed lot of restraint,honesty and patience while answering to people's comments.